However you describe grief, it’s fair to say that it isn’t neat. We experience it when we lose a loved one or a family member, but there are also more ‘taboo’ forms of grief few people talk about: the loss of an unborn child, the loss of children, the loss of a relationship, the death of a pet, or estrangement in an important relationship—perhaps even from a parent you’ve never met. Many of us have heard about the five stages of grief: Denial, Anger, Bargaining, Depression and Acceptance. And these are all valid. You will wade through them as you remember what you’ve lost, and by taking the journey through them you will find healing. The deep ache will still be there, but the acceptance of what was lost won’t cloud your days as much. Yet, we don’t all navigate grief that ‘easily’. In fact, none of us ever grieve in the cookie cutter mould of what is often described. This can leave us feeling like a failure months and years after a loss, and can make us depressed and feel perpetually numb and isolated. 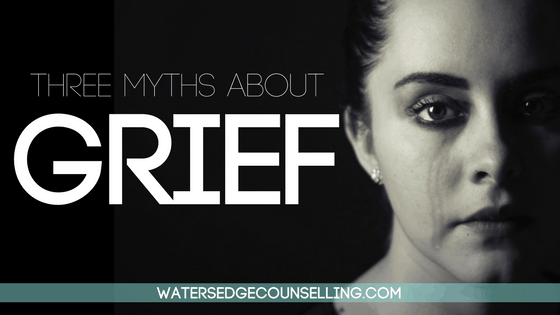 This infographic by Happify disproves three common myths about grief. That grief happens in sequence. That the only way to work through grief is to express every negative emotion (even the ones that harm you, or the people around you). Women suffer more in grief. Take a look at the infographic and learn more about what grief looks like in reality. Happify also include some tips for getting through the early, middle and late stages of grief. Remember, your grief is valid whether your loss happened days, months or years ago. We hope that by breaking these myths and taboos you are reminded you aren’t alone in this process, and you can get through it. Are you grieving a loss? Do you know someone who is grieving a loss and you don’t know how to help them? Talking to a Counselling Professional about your experience in a safe and nurturing space may be the support you need to navigate your grief experience. For a FREE 10 minute consultation as to how we can help you, ring Colleen on 0434 337 245 or Duncan on 0434 331 243 or press book now to book on the online diary.